You will probably like this game if you like logic puzzles. 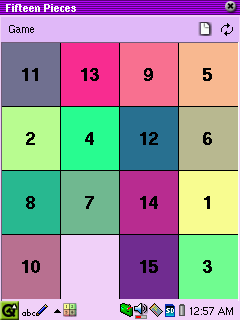 Fifteen is the classic game of 15, where you have to order the numbers 1 to 15 on a square of 16 fields. It is only possible to move a piece adjacent to the remaining empty field to the empty field. Doing this in the right sequence will order the game board. The game is very simple, concerning graphics, design and handling. But on the other hand what else can you do when implementing the game of fifteen? Therefore, there are not many problems with the game. A hightscore list, counting the moves or a better move animation would help but nothing prevents you from enjyoing the game if you like the game of 15.